Hey, all! No special theme this week, just some cool books that I’ve been waiting to tell you about! And today, we have a special guest review by my pal Josh Prigge! Funny story how I met Josh. I was sitting in a restaurant waiting for late friends, scrolling through Instagram. I follow a cool account called @books_of_shelf that features photos of interesting graphic novels. So while sitting there waiting, I messaged the account, asking where they got the books that they had featured. A thirty-minute discussion later, Josh and I were exchanging titles to add to our “mush read list,” and here we are! I asked him to guest review for me, and he accepted…he selected Last Look as his title. I have not read this one yet, but dang it sounds interesting! “There is always a last of everything? 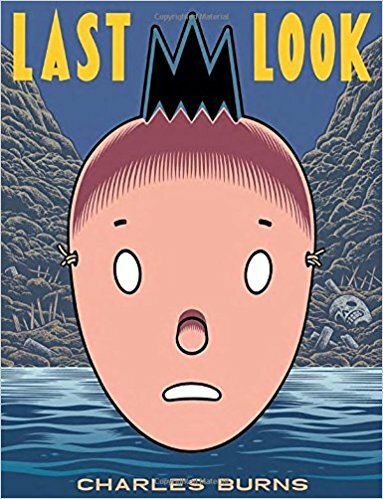 Your last pill, your last cigarette, your last sip of water, your last good kiss.” Last Look by Charles Burns is the combined trilogy of X’ed out, The Hive, and Sugar Skull. Having never read anything by Charles Burns, I really had no idea what to expect going into this title. After I finished reading it, I sat at my desk, frozen in awe to what I just experienced. After opening the book, we are met with the first page: asn abstract series of black and red rectangular blocks, and nothing else. The next page follows this pattern only inverse. The main character wakes up in bed with a bandage on his head, pills on an end table, no windows and a red brick wall with a hole in it. After watching his black cat pass through the hole, he has no choice but to follow after it, leading the reader through a gateway to one masterful mind trip. Last Look is a blurred journey through memories, with a theme of regret. One aspect of the story follows the main character through an alienish landscape whereas the other deals with his haunting actions of the past. This book could best be described as a graphic novel cocktail of David Lynch’s Mulholland Drive, Christopher Nolan’s Memento, and Silent Hill 2 & 4. The story reads as one continuous ride through a trippy stream of consciousness. The way that the main characters recollections are interwoven through the nightmarish alien world is nothing less than brilliant. The constant back and forth through memories and altered states offers a wild ride. With stories such as this, it’s often difficult not to let things spin out of control, however, Last Look finds a way to nicely (possibly frustratingly and debatably) wrap things up in the end. When you reach the end, you may jump back to the beginning, and if you are like me, you will want to find someone to talk to about it. 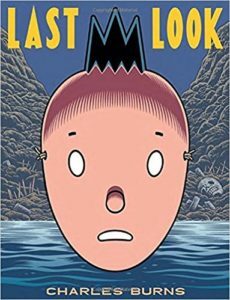 Last Look excels at bringing the reader into the actual mind of the main character. It does especially well at showing how our brain drifts from memory to memory. It’s artistically simple yet effective in every sense. Strong language and adult themes make this a read for adults. This book is 176 pages and will not be difficult to finish…because when you start reading, you won’t be able to stop. This is one of the best graphic novels I have read in awhile, and I strongly recommend it to anyone with an open mind who is a fan of excellent cerebral storytelling. Thanks for the review, Josh! I can’t wait to check this one out! Go give him a follow, y’all!